Earth and Mars both possessed abundant surface water shortly after their formation, but unlike on Earth, where oceans still cover 70 percent of the planet, the Martian surface may have acted like a giant sponge, soaking up the water and trapping it deep within the planet’s interior. That’s according to a new paper from an international team of researchers published this week in the journal Nature, showing that planetary rock chemistry can have significant controls on a planet’s future development and prospects for life. Richard Palin, assistant professor of metamorphic geology at Colorado School of Mines, is among the co-authors of the paper, “The divergent fates of primitive hydrospheric water on Earth and Mars.” The international team led by the University of Oxford’s Jon Wade also included researchers from Simon Fraser University, Pennsylvania State University and the Nanyang Technological University in Singapore. The study stemmed from a discussion of how the initial stages of planetary formation may influence the composition and physical properties of a planet’s outer crust. 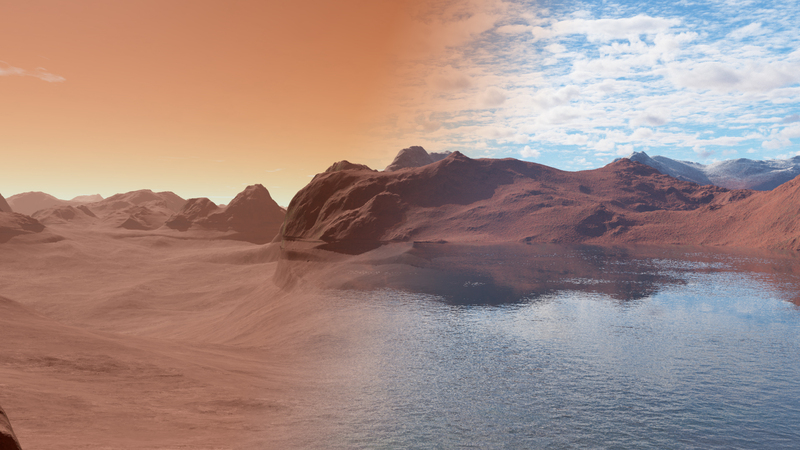 Researchers chose to compare the primitive hydrosphere evolution of Mars and Earth because while the planets have a similar composition, their fates have been very different. Calculations for Earth and Mars revealed the relative volume of water that could be removed from each planet’s surface via reactions that occur around volcanic regions. The Martian crust contains more iron than Earth’s, which is predicted to have caused Mars’ crust to form greater quantities of hydrous minerals during burial and metamorphism. Hydrous minerals can hold molecular water in their crystalline structures, and so provide a way for liquid water to be directly removed from the hydrosphere. In other words, the Martian crust could have effectively acted like a geological sponge, soaking up surface water and irretrievably trapping it within the planet’s crust and mantle. Mass-balance calculations suggest that this sequestration process could have consumed a 3-kilometer-deep ocean covering the entire Martian surface.